Melanie Porter has long used giant needles for her knitting creations, and here she shares 35 stylish designs with you. There are lots of projects to knit using needles from sizes 10mm to 25mm, as well as some that use extra large needles (35mm), and the great thing about using big needles is that you can work up items quickly to great effect. 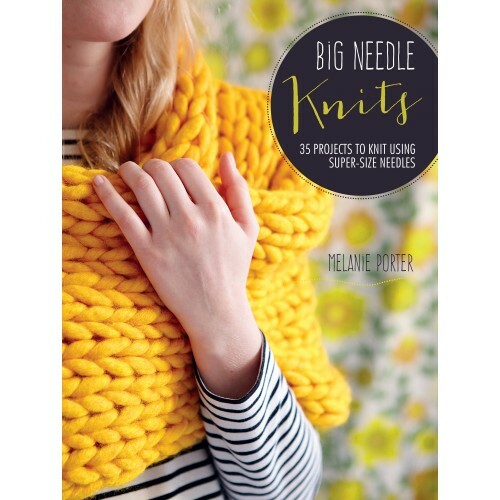 Divided into three chapters - Chunky Textures, Summer Knits and Mega Knits - and using a variety of beautiful chunky yarns, there's a whole host of inspiration here for any knitter. Hats, scarves and other winter items are all featured in different stitches and yarns, but there are lightweight knits too, including a tunic dress, shrug cardigan and cowl. Go from small-scale ideas - a necklace, headband, coin purse and bangles - to supersize projects, such as the oversized shawl, throw, body warmer and pouffe. There's a comprehensive techniques section, too, which covers the basics for beginners and acts as a reference guide for experienced knitters..